Minu smiled as she saw my homemade sign, finished in a rush to get to the march. We boarded the subway, surrounded by people who were clearly traveling to the same place we were. On our way to demonstrate against gun violence in America, we discussed our SAT scores and her upcoming trip to Japan. While we talked about the minor dramas of our junior year, students from Marjory Stoneman Douglas High School were preparing to speak in front of an international audience about the trauma they experienced during a school shooting. Until late February, no major news source was giving a platform to Generation Z. Now, images of Emma González and her fellow survivors are ubiquitous. A classmate of mine at Beacon High School, Etta Gold, thinks “most kids are scared of the bureaucracy because they don’t believe they can actually change the law,” but the teenagers from Parkland are “inspiring when it comes to enforcing change.” I was impressed by their capacity to organize a national march, amid their own trauma and despite their age. Beacon junior Sam Sheridan echoed Etta’s sentiments: “Seeing people your own age [speak] makes a difference.” I wasn’t shocked to see that some of the few public figures who shared my views on privilege, gun control, and the president were high-school victims of gun violence. During the march, I held my sign high as I listened to the solemn, empowering words of survivors and activists. Parkland student Meghan Bohner spoke about her firsthand experience with the shooter when I noticed tears streaming down my face. Around noon, we began our march around Central Park, booing President Trump’s New York properties along the way. My eyes were fixed on the crowd as protesters raised their fists and demanded change. 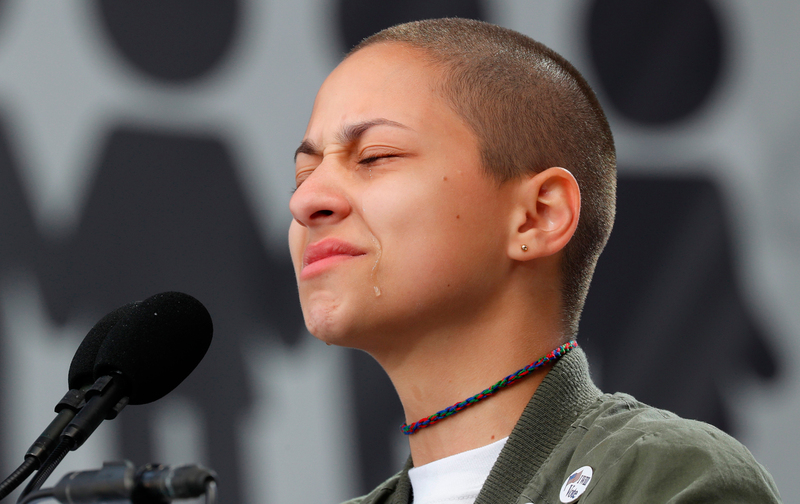 Watching Emma González’s speech later that day, I understood her power. She captivated the nation with silence. Etta agreed: “Something about González compelled [her] to keep watching.” Her bravery, so unwavering, makes change viable. If she could face the world with her questions, so could I. Her extraordinary speech rejected the mundane thoughts and prayers of so many politicians. Her very presence has created a path for teenagers to follow. Those of us who chose to walk that path have a chance at ending gun violence in black communities, preventing the sale of assault rifles, and most of all—saving lives. In González’s gut-wrenching silence, audiences could search for the solution and perhaps find it within themselves. Soon after the march, Minu, who is a year older than me, found out she was eligible to become a registered voter. It will “feel good to really participate, she told me.” Before the March for Our Lives, I felt as though America could make its teens feel invisible. As I watched Minu join the thousands of newly registered voters, I realized that our teen spirit can no longer be ignored. Sophia SteinbergSophia Steinberg is a junior at Beacon High School in New York City.